it's textmode. the adress to the screen is loaded from the code itself. SI points to STOSW + the DB 219, translating to 0xABDB which lands in ES. CX is not used, the only reason it is CX and not something else : the combination of CX and [SI] makes the modbyte of LES = 0x0C which is the instruction OR AL,(byte). The byte behind that is 219 which is the ASCII Code for a full char. 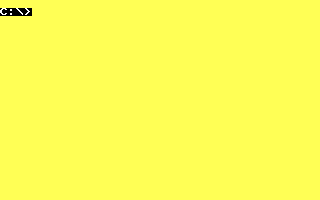 A yellow char has to be 219 (or 177,178,179) because as a background color, it would be brown. Now at the second run, OR AL,219 is executed. 0x0E in AH is just yellow, 0x1E, 0x2E etc. with different background colors are also possible. The first run is critical, but the FLD instruction (opcode 219) luckily does no harm and aligns with the code right at JMP instruction. page created in 0.014503 seconds with 15 queries.